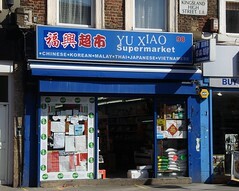 Small Chinese supermarket on Kingsland High Street in Dalston. They've made the most of the small space; the shelves are crammed with packages, and more products are stored in open boxes on the floor. They have a decent selection of pickled/preserved/fermented vegetables, a couple of kinds of dry tofu, various dried mushrooms and edible fungi, jars of yellow bean sauce etc, soy sauces, teas, and sweet and savoury snack foods. Like most East/Southeast Asian supermarkets, they have a fair selection of noodles — instant packets, cup noodle style, rice noodles, and (in April 2011) the rather intriguing "Fuzhou dried noodle slice" (福州麵片), which turned out to be small squarish white wheat noodles. On Kake's April 2011 visit their instant noodles were all wheat-based, which was a little disappointing as I prefer the rice noodle version. A couple of fridges near the front hold a small selection of fish/seafood (raw tiger prawns and whole seabass in April 2011), beansprouts, mushrooms, greens, fresh and fried tofu, and fresh ho fun noodles (which aren't always easy to find). There are also a few freezers with more seafood and dumplings/dim sum items. On all of Kake's visits, service has been helpful and friendly. Accessibility: Fairly large step to get in, and it's quite cramped inside. Last edited 2016-08-14 15:22:00 (version 3; diff). List all versions. Page last edited 2016-08-14 15:22:00 (version 3).